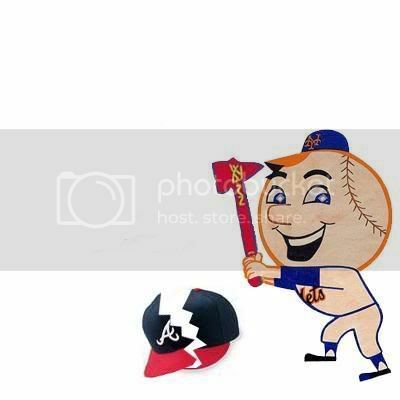 Mets Are NL East Champs - Thank You Pittsburgh!! It was well worth the wait! All day I was cursing The Pirates. Tomorrow I'll celebrate them for making tonight possible. Perfect timeing that tomorrow is Talk Like A Pirate Day! Pretty much all season long, I've longed to be back up in New York to savor the Mets magic. This afternoon? Oh, I am glad to be out of that circus. Swept by the Pirates? For crying out loud! I can just hear it. How can we expect the Mets to perform well in the postseason against the Padres, Dodgers or Cardinals when they can't beat The Pirates when the NL East crown was in their grasp? To hell with that noise. Phillies are rolling along. The Mets will try to clinch at Shea tomorrow. I've done all I can do from my end. I watched the game downstairs on Friday, upstairs on Saturday, and listened to the radio boadcast on the computer today. All with the same result. Tomorrow I'll try joining the game in progress, as Steve Trachsel will attempt to shut down the Marlins in front of the home crowd. Trachsel's postseason roster spot is in jeopardy as he is line to have the highest ERA in club history among pitchers who've won 15 games or more in a season. He'll face righthanded pitcher Brian Moehler. Moehler is 7-8 with a 6.12 ERA, but Mets fans are most happy that the guy throws with with his right arm. 34 year old Moehler is a UNCG grad, something I'm aspiring to be, and after learning he's making $1.5 million dollars this year, yeah, I am really aspiring to finish my degree at UNCG. I'll put $1.5 mil on my salary requirements for my next gig. Moehler hasn't faced the Mets this season, but last year he was 1-2 with a 3.00 ERA in four appearances (two as a starter) against the Mets. Carlos Beltran is batting .538 (7 for 13) against Moehler for his career, and Carlos Delgado has 3 career homeruns and a .348 average off him. Jose Valentin is just 5 for 25 against Moehler with a .259 on base percentage. On the other side, Miguel Cabrera has a.579 batting average with 3 homeruns against Trachsel. No one else on the Marlins have more than 7 lifetime at bats against him. Phils were winning 6-4 in the ninth, but Houston had Brad Ausmus up to the plate as the winning run against Tom Gordon. On a 3-0 count, Ausmus meekly grounded out to short and the magic number remains at one. The Phils are now just 1 game out of the wild card, pending the outcome of today's Dodgers/Padres game. Okay, I've had enough for today. See you tomorrow. What to do if you're an out-of-market Mets fan and the team is on the verge of clinching? The last two nights I've been able to watch SNY on DirecTV, but this afternoon's game is on New York's Channel 11, (is it CW yet?) and I have no access to that channel! What are the options? We don't want to miss the clincher! Gameday Audio. I signed up for this the last two years. For $15 a year, you get access to the radio broacasts of every team in baseball. This is especially great for afternoon weekday games, for listening at my desk at work. This is probably what I'm going to do this afternoon. If you haven't signed up for it yet, it's just $8 for the rest of the year, including the postseason. MLB.TV. If you have a broadband connection, for $19.95 you can watch the games on your computer. You get virtually every game for every team the rest of the year. I did this a few times last season, when you could buy games for about $5.00 each. This year you could only buy by the month or for the season. But today, you may want to consider this an option - $20. That's less than the price of a ticket to today's game if you could make it to Pittsburgh! Hope the Mets lose today and the Phillies win, so the Mets can try to clinch at home tomorrow night. I am NOT rooting for this to happen. First of all, I've had enough of the Phillies and want them to lose every game for the rest of the year. Second of all, while it would be great for the Mets to win on their home field, I'm getting impatient. Get it done today, guys. I'll be listening!!! By the way, for the game on the 25th, the last home game of the season, the team is handing out some atrocity called Fandinis to the first 25,000 fans who come to the game. I guess they are hoping to have these catch on for the playoffs or something? 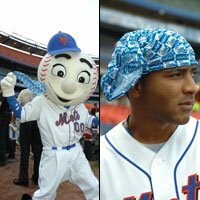 I am sorry, but I do not want these stupid things to become part of Mets lore. If you go to the game, use the fake do-rags to hold your soft pretzel and then dump 'em on the way to the bathroom. These things are hideous!! Worst idea since Our Team Our Time theme song.